The figure used for this unit is a Heroclix figure from the DC 75th Anniversary set. Its model number and name are #041/Indigo-1. The figure used for this unit is a Heroclix figure from the War of the Light Fast Forces set. Its model number and name are #005/Indigo-1. Last edited by Ronin; November 5th, 2017 at 01:48 PM. Start the game with 3 indigo Battery Markers on this card. Add 1 to Indigo-1's Range and Defense numbers for each indigo Battery Marker on this card. If Indigo-1 or a figure you control adjacent to Indigo-1 is attacked by an opponent's figure and would receive one or more wounds but not be destroyed, instead of placing those Wound Markers, you may remove one or more indigo Battery Markers from this card. Remove one unrevealed Order Marker at random from the attacking figure’s Army Card for each indigo Battery Marker you remove. After revealing an Order Marker on this card and instead of taking a turn with Indigo-1, you may remove an indigo Battery Marker from this card and choose one friendly small or medium figure for each indigo Battery Marker remaining on this card. Chosen figures must be within 2 clear sight spaces of Indigo-1. Place Indigo-1 on any empty space on the battlefield and then place each chosen figure on any empty space adjacent to Indigo-1. Figures moved by this special power will not take any leaving engagement attacks. Last edited by TrollBrute; August 21st, 2016 at 12:05 PM. Fix the formatting of the title of the second power, but looking good! Looks good, but we'll have to be careful that she's not too strong with pods. She can teleport up to 3 figures anywhere on the battlefield and then has 3 chances to block attacks for them. John Stewart is probably still stronger on that front, but he will be slower and Indigo-1 isn't limited to non-flying figures, so it's something we'll need to keep an eye out for. Should Blue Power Stave be Indigo Power Stave? Tribal Teleportation is a bit worrysome, yeah, but it's a good "big splashy" power for a faction leader. Just need to make sure it stays in line. For sure. And there are ways to pull back on it (like restricting it to adjacent figures, or non-flying figures) if needed. One thing that will help is she has to remove a battery marker to do it, which will hurt her in other ways. There's also the possibility of moving her down to only 3 markers if need be. Should the name not be Indigo Lantern? Why is the power called a stave? The indigo tribe coated their staffs in the indigo light power sure. But Abin Sur created the power rings from the light & it was forced onto Iroque. 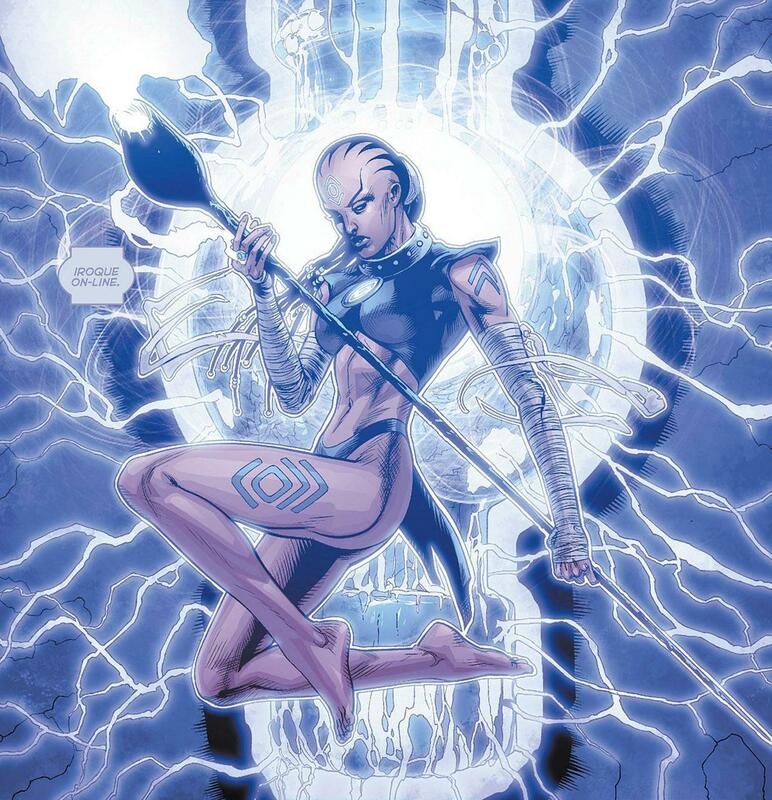 Iroque isn't part of the tribe she leads the lanterns & has a designation of Indigo-1 which to me was just the equivalent of calling her general. The ring is still the source of her power like all other lanterns & also needs to be re-charged unlike the staff. These details here don't seem to align. For the record, A3N, it was forced onto every member of the Indigo Tribe; they refer to themselves as a tribe instead of a corps because they have until recently, kept to themselves; actually the stave IS their lantern, however I believe you are confusing a lantern with a Central Power Battery. Each member has their own lantern, but each color has only one Central Power Battery. Green was on Oa, Yellow on either Qward or Korgar, Red on Ysmault, Violet on Zamaron, Etc. Larfleeze carries his CPB as a Lantern. Well, the breathing period is up here without too much action .... Time for the ERB? Indigo seems to be the forgotten color of the rainbow. Red, orange, yellow, green, blue, and purple are such attention hogs! I always love the batteries! Let’s see what else they can do. Here’s the protection, but with an added bonus of nerfing some Order Markers. You’ve created a vulnerability in that you can’t use this if the attacking figure is able to actually deliver a killing blow. Based on the wording, you could teleport, then move Indigo-1 after the placement. Checking Ye Olde Sortable Indexe, Silver Samurai can move before teleporting, so there is precedence for combining warping with moving. This works hand-in-hand with the Light of Compassion, because you can teleport to bring allies within his aura of Compassion. Much like Kilowog, he’s a high cost supporting unit. Here's what I got back from ERB. I'm considering doing the initial soon even though he can't go into playtesting until Mid-Nite gets through.